I have over 78 highlighted points throughout this book that I can go back to and reference when I need direction or answers to questions. I really enjoyed this book as it brought me back to the basics of what made our country great. Our founding fathers understood the importance of small government and a strong democratic society. I believe Kadashan’s prescient book really should be shared with everybody. Especially in today’s political climate, it could really help put our lives in perspective with respect to personal happiness and political ideology. For six years Kadashan wrote a column for the Juneau Empire, the major newspaper for the capital city of Alaska., From a Native American Perspective—Kadashan Speaks about the how our governments are using legal plunder to promote the taking over all means of production; this essay based on a compilation of some of the writings that appeared in the column. Kadashan is his Tlingit name and he lives in a small village in the southeastern part of Alaska. He was named after his great grandfather who guided the world traveler John Muir through the inside passage of Southeast Alaska into Glacier Bay. Kadashan was born in Sitka, Alaska but makes his home in Yakutat where he grew up as a commercial fisherman. Kadashan means Red Tide Coming. When the red tide appears in the bays of Alaska it is a warning to the people not to eat any shell fish such as clams and crab because there are dangerous elements in the red water that causes immediate illness and death. Kadashan’s writings are warnings about what he thinks happens when we do not live in accordance with Natural Law. He obtained his formal education at Yakutat and Sitka, Alaska, Holland, Michigan and attended Sheldon Jackson College in Sitka and Brigham Young University in Provo, Utah. He self-published two books: WHEN RAVEN CRIES and a short story collection called THIS IS YAKUTAT. 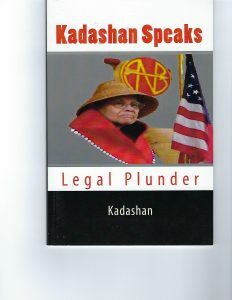 His political commentaries are included in this book and Kadashan Speaks, Legal Plunder. Kadashan was fortunate to serve as the elected President of the Yakutat Tlingit Tribe for twelve years. Here he learned about the functions of tribal governments and their relationship with the federal government from which many of his essays are founded.